Summer is in full swing, and to me that means parties! Well, kids, this blog post is part of a party – a virtual pot-luck – sponsored by Lucky Leaf! You remember them, right? They sent me to Camp Blogaway* earlier this year. While I was at camp I asked a few other talented bloggers to create some fun recipes perfect for summer picnics and pot-lucks all using Lucky Leaf Premium Pie Fillings. If you want to see the other scrumptious recipes they created check out the hashtag #LuckyLeafLuckyMe on Twitter! 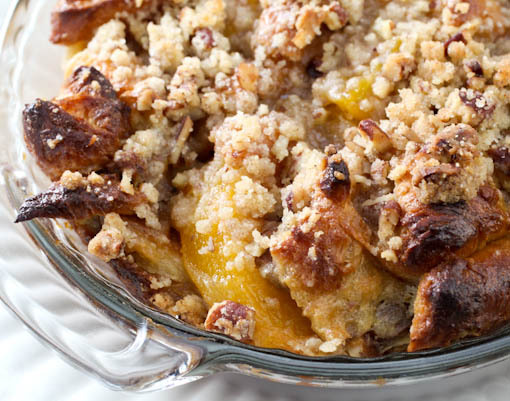 My contribution to the party is an indulgent, buttery, rich, and perfectly peachy bread pudding sure to wreck your swimsuit diet. That’s right, I do not care if you fit into your swimsuit! 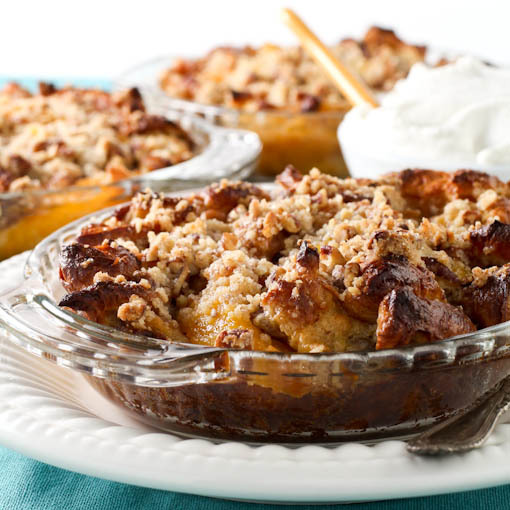 Loaded with pecans, Lucky Leaf Premium Peach Pie Filling, and topped with a crisp pecan streusel, this bread pudding is the perfect end to a summer party! 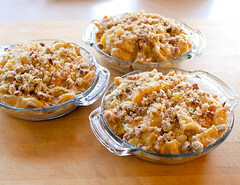 The peach filling is pretty sweet, so you do not need to add much sugar to the custard. What sugar I did add was brown sugar to add a rich undertone to the pudding. 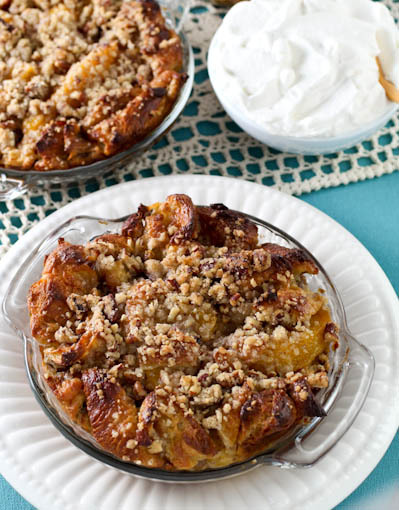 It compliments the pecans and peaches without tasting too heavy. If you can find them I would use only butter croissants here. They provide the best flavor and are less greasy than croissants made with shortening. If you are anti-pecan – and if you are that is fine because that means more for me – feel free to use almonds or walnuts here. You could also leave the nuts out completly if you wanted and add something totally different – such as white chocolate chips or raisins- and it would still taste wonderful. This is best served slightly warm or at room temperature. 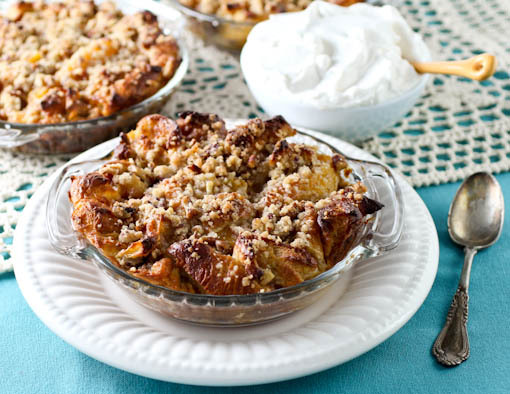 It goes well with freshly whipped cream or a scoop of vanilla ice cream! Heat the oven to 350F and spray either a 9x13-inch baking dish, or 4 6-inch pie plates, with non-stick cooking spray. In a large bowl combine the melted butter and sugar. Whisk until thoroughly combined and no lumps of sugar remain. 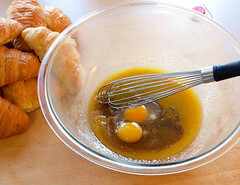 Add the eggs, vanilla, and salt and mix until the eggs are well beaten. Stream in the milk while constantly whisking. Set aside. 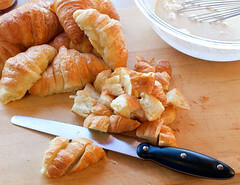 Add the cubed croissants to the custard mixture and fold to combine. Next add the pie filling and pecans and gently fold to distribute. 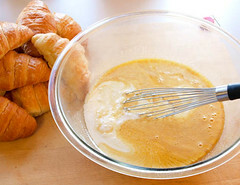 Spoon the croissant mixture into the prepared pan and set aside. 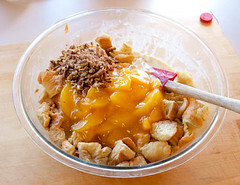 While the croissants soak prepare the streusel topping. 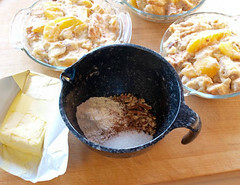 In a small bowl combine the pecans, flour, and sugar until well mixed. Add the butter and, with your fingers, rub it into the flour mixture until it resembles coarse sand. 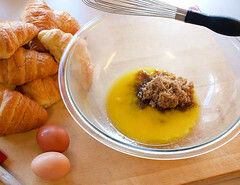 Evenly spread the streusel evenly over the top of the croissant mixture. Bake for 40 to 50 minutes, or until the pudding is puffed all over and is deeply golden brown with some crispy dark bits. Let the pudding cool for 30 to 40 minutes before serving. *Evil Shenanigans Product Review Policy and Payment Disclosure– Lucky Leaf provided me a sponsorship to Camp Blogaway, an airfare stipend, samples of their pie filling, and gift items to give away at camp at no cost in exchange for this blog post. Any opinion expressed is my own and is not influenced in any way by the manufacturer/PR firm. I only review products that I have personally tested and endorse.